Weight Loss Formula | Improved Weight Loss Supplement | Get Here! Based on the latest research findings. Increases viscosity of the alimentary bolus, slows down gastric emptying and induces a greater sensation of satiety. a lipid- and blood glucose-lowering effect, by reducing absorption of fat and sugar in the intestines. Weight Loss Formula contains the patented extract Propol® which helps achieve a trimmer figure by means of a natural appetite-suppressant called konjac (Amorphophallus konjac). Recognised for its slimming properties, the plant’s tuber has a high fibre content. When ingested, it expands in the stomach to reduce both the sensation of hunger and the absorption of dietary fat, and to slow the release of glucose to the intestinal mucosa. Weight Loss Formula also contains a patented blend of plant extracts called Lowat™. Obtained from Piper betle leaf and dolichus biflorus seeds, Lowat™ has been developed to act on adiponectin, a hormone involved in controlling fat metabolism. According to the studies conducted on this blend, it offers a powerful fat-burning effect by helping to slow down the formation fat cells, reduce fat accumulation and promote the breakdown of lipids. Weight Loss Formula also includes a selection of slimming plants. For example, guggul extract (Commiphora mukul) has been added to lower levels of cholesterol and triglycerides in the blood. Extracts of green coffee and wakamé (Undaria pinnatiﬁda) have similarly been incorporated to reduce blood lipid levels. Wakamé is also known for its high fibre content and natural appetite-suppressant effect. For optimal efficacy, the composition of Weight Loss Formula is completed by L-carnitine fumarate. This is a specific form of carnitine, an amino acid known for its fat-burning action. By promoting energy production, L-carnitine stimulates fat-burning in the body. 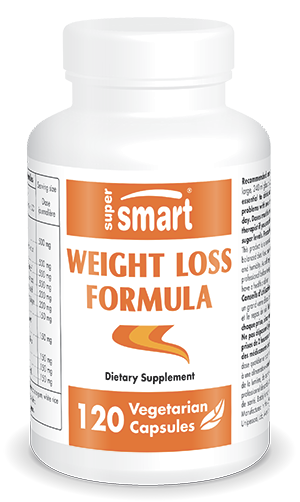 With its exceptional composition, Weight Loss Formula is an excellent supplement for supporting weight loss and achieving a trimmer figure. The suggested daily dose is two capsules before lunch and dinner, to be taken with a large glass of water. To accelerate weight loss, it can also be combined with the product Weight Loss Booster. Other ingredients : magnesium stearate, cellulose, silicon dioxide. Lowat™ - InterHealth N. I. Propol® - Shimizu - Japan. Adults. Take two vegetarian capsules with a large glass (240ml) of water half an hour before lunch and dinner. It is vital that sufficient water is drunk with each dose to avoid problems with swallowing. Do not exceed 8 capsules a day. The two doses must be taken at least 2 hours apart. Consult your therapist if you are taking medication to lower blood sugar levels.